The basic function of Parliament is to make laws. All legislative proposals have to be brought in the form of Bills before Parliament. A Bill is a statute in draft and cannot become law unless it has received the approval of both the Houses of Parliament and the assent of the President of India. The process of law making begins with the introduction of a Bill in either House of Parliament. A Bill can be introduced either by a Minister or a member other than a Minister. In the former case, it is called a Government Bill and in the latter case, it is known as a Private Member's Bill. A Bill undergoes three readings in each House, i.e., the Lok Sabha and the Rajya Sabha, before it is submitted to the President for assent. The First Reading refers to (i) motion for leave to introduce a Bill in the House on the adoption of which the Bill is introduced; or(ii) in the case of a Bill originated in and passed by the other House, the laying on the Table of the House of the Bill, as passed by the other House. 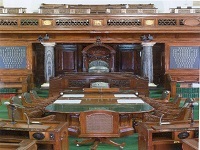 The Second Reading consists of two stages.The "First Stage" constitutes discussion on the principles of the Bill and its provisions generally on any of the following motions - that the Bill be taken into consideration; or that the Bill be referred to a Select Committee of the House; or that the Bill be referred to a Joint Committee of the Houses with the concurrence of the other House; or that the Bill be circulated for the purpose of eliciting opinion thereon. The "Second Stage" constitutes the clause by clause consideration of the Bill, as introduced in the House or as reported by a Select or Joint Committee, as the case may be. 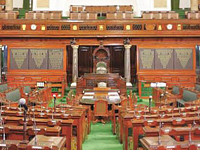 In the case of a Bill passed by Rajya Sabha and transmitted to Lok Sabha, it is first laid on the Table of Lok Sabha by the Secretary-General, Lok Sabha. In this case the Second Reading refers to the motion (i) that the Bill, as passed by Rajya Sabha, be taken into consideration; or (ii) that the Bill be referred to a Select Committee (if the Bill has not already been referred to a Joint Committee of the Houses). The Third Reading refers to the discussion on the motion that the Bill or the Bill, as amended, be passed. Almost similar procedure is followed in Rajya Sabha in respect of Bills introduced in that House. After a Bill has been finally passed by the Houses of Parliament, it is submitted to the President for his assent. After a Bill has received the assent of the President, it becomes the law of the land. 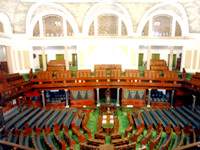 The year 1993 ushered in a new era in the history of Indian Parliament when 17 Departmentally Related Standing Committees were constituted. 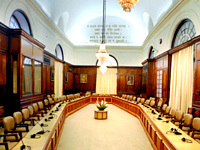 The number of Standing Committees has now been increased from 17 to 24. While 8 Committees work under the direction of the Chairman, Rajya Sabha, 16 Committees work under the direction of the Speaker, Lok Sabha. One of the important functions of these Committees is to examine such Bills introduced in either House as are referred to them by the Chairman, Rajya Sabha or the Speaker, Lok Sabha, as the case may be, and make report thereon. The reports of the Standing Committees have persuasive value. 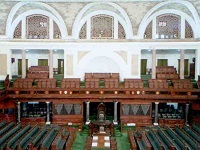 In case the Government accepts any of the recommendations of the Committee, it may bring forward official amendments at the consideration stage of the Bill or may withdraw the Bill reported by the Standing Committee and bring forward a new Bill after incorporating the recommendations of the Standing Committee. If a Bill is referred to a Select or a Joint Committee, it considers the Bill clause-by-clause just as the House does. Amendments can be moved to the various clauses by the members of the Committee. After the report of the Select or Joint Committee has been presented to the House, the member-in-charge of the Bill usually moves the motion for consideration of the Bill, as reported by the Select or Joint Committee, as the case may be. A Money Bill or a Financial Bill containing any of the provisions calculated to make a Bill a Money Bill, however, cannot be referred to a Joint Committee of the Houses. A Bill may be introduced in either House of Parliament. However,a Money Bill can not be introduced in Rajya Sabha.It can only be introduced in Lok Sabha with prior recommendation of the President for introduction in Lok Sabha. If any question arises whether a Bill is a Money Bill or not, the decision of the Speaker thereon is final. Rajya Sabha is required to return a Money Bill passed and transmitted by Lok Sabha within a period of 14 days from the date of its receipt. Rajya Sabha may return a Money Bill transmitted to it with or without recommendations. It is open to Lok Sabha to accept or reject all or any of the recommendations of Rajya Sabha. 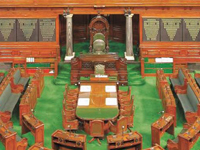 However, if Rajya Sabha does not return a Money Bill within the prescribed period of 14 days, the Bill is deemed to havebeen passed by both Houses of Parliament at the expiry of the said period of 14 days in the form in which it was passed by Lok Sabha. Like Money Bills, Bills which, inter alia, contain provisions for any of the matters attracting sub-clauses (a) to (f) of clause (1) of article 110 can also not be introduced in Rajya Sabha. They can be introduced only in Lok Sabha on the recommendation of the President. However, other restrictions in regard to Money Bills do not apply to such Bills. The Constitution vests in Parliament the power to amend the Constitution. Constitution Amendment Bills can be introduced in eitherHouse of Parliament. 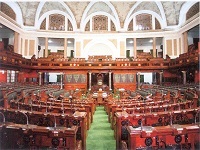 While motions for introduction of Constitution Amendment Bills are adopted by simple majority , a majority of the total membership of the House and a majority of not less than two-thirds of the members present and voting is required for adoption of effective clauses and motions for consideration and passing of these Bills. Constitution Amendment Bills affecting vital issues as enlisted in the proviso to article 368(2) of the Constitution after having been passed by the Houses of Parliament, have also to be ratified by not less than one half of the State Legislatures. Article 108(1) of the Constitution provides that when a Bill (other than a Money Bill or a Bill seeking to amend the Constitution) passed by one House is rejected by the other House or the Houses have finally disagreed as to the amendments made in the Bill or more than six months lapse from the date of the receipt of the Bill by the other House without the Bill being passed by it, the President may, unless the Bill has lapsed by reason of dissolution of Lok Sabha, notify to the Houses by message, if they are sitting, or by public notification, if they are not sitting, his intention to summon them to meet in a Joint Sitting. The President has made the Houses of Parliament (Joint Sittings and Communications) Rules in terms of clause (3) of article 118 of the Constitution to regulate the procedure with respect to Joint Sitting of Houses. So far, there have been three occasions when Bills were considered and passed in a Joint Sitting of the Houses of Parliament. After a Bill has been passed by both the Houses of Parliament, it is presented to the President for his assent. The President mayeither assent to the Bill, withhold his assent, or return the Bill, if it is not a Money Bill, with a message for reconsideration of the Bill, or any specified provisions thereof, or for considering the desirability of introducing any such amendments as he may recommend in his message. The President may either give or withhold his assent to a Money Bill. A Money Bill can not be returned to the House by the President for reconsideration. Also, the President is bound to give hisassent to Constitution Amendment Bill passed by Parliament by the prescribed special majority and, where necessary, ratified by the requisite number of State Legislatures.